Check out these two pleasant quotes, published in the current issue of Gitarre&Bass 06/2017! Order one of our in-stock-instruments within February/March 2017 and get a free professional flightcase extra! Over the last years we builded a lot of instruments aside our customshop work. A few of these instruments went to magazines or fairs for showcase purposes. But all of them were built with pleasure and for the fun of instrument making. But we decided, that their real purpose is to rock stages and rehearsal rooms! 12/16/2015 We proudly present the Black Oak Series! 08/24/2015 The Devil visits Berlin! 05/24/2014 TheDrop receives brilliant review in G&B! 02/01/2014 Beware of a true metalaxe! 12/14/2013 Devil's Choice exhibits at Metalbörse Cologne! 11/27/2013 Precious Tomegat reviewed in GrandGtrs. 09/26/2013 Devil's Choice featured at the Legacy! 08/01/2013 Devil's Choice at PartySan 2013! 05/13/2013 The new Homepage is online! 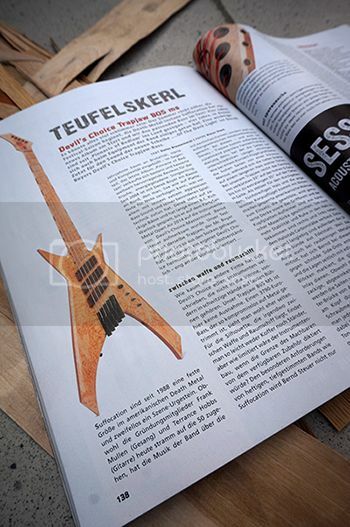 04/14/2013 Tomegat guitar got examined in "Gitarre&Bass"! 03/25/2013 The "Grand Cherry Collection - 2013"
01/21/2013 DEVIL'S CHOICE put to test! 05/09/2011 3 brand new models!